Dr. George S. Edwards, Jr. is a native of Raleigh, NC, who earned his doctorate in medicine from the University of North Carolina in 1978. This was followed by an internship and residency in Orthopaedic Surgery at the University of Texas Health Sciences Center. He completed his formal training with a hand surgery fellowship at Massachusetts General Hospital in Boston. Upon completion of his fellowship in 1984, he entered private practice in Raleigh. He established the Raleigh Hand Clinic in 1988 and was a co-founder of the Raleigh Hand Center in 1991. 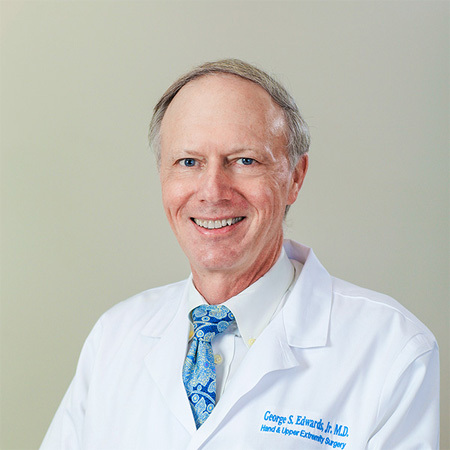 Dr. Edwards is a fellow of the American Academy of Orthopaedic Surgeons and a member of the American Society for Surgery of the Hand and is an associate clinical professor in orthopaedics at the University of North Carolina. He is board-certified in orthopaedic surgery with additional certification in hand and upper extremity surgery. He is married and has three children. His hobbies include golf, swimming, hiking, and playing the piano. Click here to view Dr. Edwards’ personal website.